This Easy Breaded Cauliflower is the perfect side dish for any occasion. It’s the perfect addition to your holiday menu. Raise your hand if you like recipes with only a few ingredients? Let me tell you a little secret. This Easy Breaded Cauliflower is my favorite recipe…ever! So since I love you all so much, I am sharing the recipe with you today. My mom has been making cauliflower this way for years….and years…and years. It’s the one side dish that is always served at our Thanksgiving dinner. I really love cauliflower prepared anyway, but this way is my favorite. And in full disclosure, it’s definitely not the healthiest way to enjoy it because it’s pan-fried in butter and breadcrumbs. Because you know – everything is better with butter. We had a holiday open house at our farm market this past weekend. 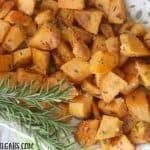 I prepared a few favorite fall recipes from the blog (and the vegetables we grow on our farm) to help give our customers ideas on what to prepare for their Thanksgiving feast. This Easy Breaded Cauliflower was a big hit. You can check out the Facebook Live I did during the event here. The secret to this recipe is to blanch the cauliflower about four to five minutes first. Then, heat one-half stick of butter in a skillet or frying pan and toast the breadcrumbs for about one minute. Now, add the drained cauliflower to the skillet and toss gently to coat. As you toss in the pan, that breadcrumbs will coat the cauliflower and because nice and crispy. The end result is a crispy, crunchy, buttery (did I use enough adjectives?) easy breaded cauliflower recipe. If you are serving this for a holiday or special occasion, you can blanch the cauliflower the night before. Then all you have to do is bread them right before serving. This Easy Breaded Cauliflower is the perfect side dish for any occasion. It's the perfect addition to your holiday menu. Bring a large pot of salted water to a boil. Cut cauliflower into florets. Add them to the water and blanch for 4-5 minutes. Drain and set aside. Heat a large skillet on medium-high heat. Add butter to melt. When butter is melted lower heat to medium and stir in breadcrumbs. Toast for about a minute. Add cauliflower and toss gently to coat with breadcrumbs. Cook 3-4 minutes until crispy. Save this Easy Breaded Cauliflower Recipe. Pin the image below to your favorite Pinterest Board.